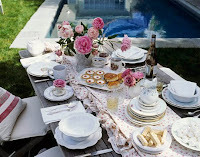 Admiring Pretty Things: Set The Table, Set The Tone! When I was a little girl my favorite job was setting the table. I loved to try and think of new ways to make everything look pretty. My youngest daughter also loves this job. She insists on pretty napkins and candles every night at dinner. We had lots of fun together making her birthday table as pretty as could be. I am always inspired by Rachel Ashwell. 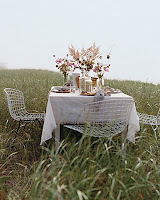 I adore this table setting by her below. Her range of plates and other yummy stuff at Target is pretty incredible for the price if you ask me. 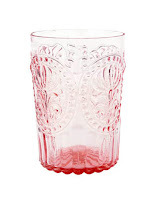 And I am for sure getting myself some of these yummy pink Tumblers at Anthropologie this week! Just had to end today's posting with the image below taken from Martha.